one more pair of leaves, scrapper this time. Kerry, it looks like there might have been a problem uploading your block photo. This one appears to be the same as Glenna’s (which she emailed me about, so I know it’s hers). There is another LARGE mystery upload from about the same time that looks like it is a photo file that didn’t completely upload. You might want to read this post in the help topics on Uploading problems to see if it applies to your problematic photo upload. Very strange! It looked okay on my end. I guess that’s because I already had the file on my computer. I’ll get that fixed this evening. well, I don’t know what to tell you. I see what you mean… that’s definitely the same photo., but it’s the photo I took last night of my blocks. I am sorry it took me so long to go to the source and confirm it is definitely your photo and your blocks. The outstanding question now is whether your light fabrics follow the guideline of being not just white/cream? Okay, I give up. Take me out of the lotto. Apparently I can’t make a block without being grilled about it… TWICE. This isn’t fun. And no, none of them are just whiye/cream. Have a nice day. If my email messages to you haven’t been clear, let me apologize publicly for not finding the time from the beginning to fact check the info I was given to determine that the duplicated photo was yours. TOTALLY MY FAULT and I am truly sorry for making your first block lotto experience a bad one. 1. 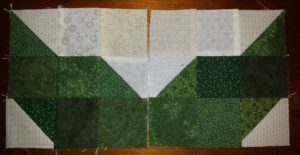 The guidelines are designed to create a set of scrappy blocks that will play nicely together in the winners’ quilts. 2. When someone posts a block that LOOKS wrong even when it is perfectly right, another quilter may use it as license to create blocks that ARE WRONG, using what they think they see as a reason to slide down the slippery slope. One month, this phenomenon resulted in so many wrong blocks, we had a separate drawing for them. 3. If I post a comment confirming that the blocks follow the guidelines when it is ambiguous in the photo, I ward off any questions/complaints from others. I am sorry you have had a rocky start at blocklotto.com – I wish you would give it another chance, but I completely understand if you want to take your blocks and go home. I will remove your blocks from the list … and gladly out them back if you change your mind. Thanks for the offer, but I’m going to have to say it’s not for me. I’ll still stop by and check out the gallery though, because there are some AMAZING quilts made by this group. So sorry If the uploading mishap caused all this. I could not tell what went on so I had to ask you to look at it Sophie. Kerry If you were upset because of this mishap I am sorry don’t let this change your mind about the group. I took new photos in bright light to post the others looked dark..
No, no… please don’t feel bad. I wouldn’t normally go into all of this, but I want you to understand that I’m not upset with anyone, and neither of you should feel bad at all. Here’s my situation: I have a husband who has been critically ill for almost 8 years, and at this point I’m stretched to my absolute limit with regards to how much stress I can handle. I wish I was one of those cool people who doesn’t care what other people think, but I’m not. I’m one of those emotional people who cares deeply what other people think, and while this is usually quite manageable, at this point in my life I’m already always stressed almost to the breaking point. Sophie, when you told me I sent the wrong picture that should have been so minor, but my reaction was “oh, no! I’ve let them down already!”. Then when I found out it was my picture after all, I was mortified that I would have to tell you that you two had made an error. If I had had time I probably would have made a whole new set of blocks just so I wouldn’t have had to tell you it wasn’t my mistake. So, as you can see… it’s not you, it’s me. My life is a big ball of stress and right now I just don’t play well with others. So I’m going to go off into my sewing corner by myself and make something that won’t have to be subjected to any scrutiny at all. I might not even look at it myself!